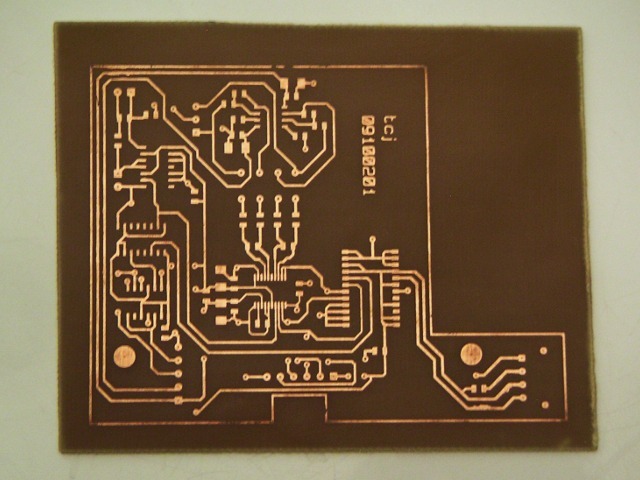 Producing moderately complex single and double sided etched circuit boards at home using the toner transfer method is not too hard if patience and a consistent method are used. I've evolved a check list that works for me, with the equipment and materials I have, but as a lot of it was developed and modified from the methods of other people, it may need to be developed and modified for each individual's use. A lot probably depends on the laser printer used. The one I have now is a Brother HL-2070N, and I think that Brother printers are not considered the best for toner transfer. All the same, I've got it to work fairly well. 1. Design the artwork using your favorite pcb layout software. I use KiCAD, which I started using because it was available for Linux, was free, and looked better and more stable than the other stuff out there. It has evolved into a very capable program, able to handle 16 copper layers and a large collection of technical layers. I never use more than three layers - top, bottom, and one for jumpers, and I try to get away with one all-purpose signal layer (top), a bottom layer groundplane with no traces on it, plus one jumper layer. If I use the solid bottom layer groundplane, I drill a via for each component lead that connects to ground. When etching, I just cover the bottom copper with plastic tape to protect it from the etchant. If I use both top and bottom layers as signal layers, I will try to spread groundplane over most of the board, especially on the bottom, if only to minimize the need for etchant. 3. Import into an image manipulation program. I use GIMP. Here you can fit it onto convenient paper dimensions, center it as needed, and clean up anything that needs cleaning up. I usually remove all of the board outline except for corners, in case traces adjacent to the outline want to bleed over onto it. 4. There's a lot of discussion on the web about what paper to use. There seems to be agreement that the stuff purpose-made for toner transfer doesn't work any better than other options. What is needed is something with a slippery enough surface that it will allow the toner to transfer to copper with heat and pressure, without bringing a lot of extra stuff with it. A lot of people recommend various of the photo papers, but I find that their clay coatings transfer with the toner and refuse to wash off before etching. I have used the slippery backing paper used to hold sheets of adhesive labels, but got so-so results. I have now settled on pages torn from the New Yorker (Time or something similar would probably work as well). [Update Jan '13 - I've now found the ideal paper. I sometimes get an envelope full of coupons in the mail - it's marked 'Valpak' - and the coupons inside are printed on paper that works really well. It's thin, and its clay coating leaves no residue on the copper. Also, after an hour's soaking, the paper crumbles right off.] It doesn't matter if there's printing on them; the ink doesn't transfer. Print the artwork on this paper. It will be a mirror image (for the top side). 5. Cut some (double sided) copper-clad to a size a little larger than the artwork. At least a tenth of an inch margin all around is good, more may be better. I've found that toner sometimes doesn't transfer well near the edge of the board, so it's a mistake to cut the board to size before etching. Bevel the edges of the board (four edges on both sides) with a file. This will encourage better contact with the iron. 6. Scrub the blank board with steel wool, then clean it off with alcohol on a piece of paper towel. I use 91% isopropanol, because it's cheap and easy to get at pharmacies. From now on, avoid touching the board surface, as skin oils may affect toner adhesion. Now you should expose the surface about to be etched to the etchant (ferric chloride - I use the stuff Radio Shack sells, but so far as I know, all the ferric chloride etchants are the same). Rub some on with a paper towel or a piece of sponge, trying for a uniform dull brown color. This should take about 30 seconds, and seems to provide a better grip for the toner than the bare copper surface would. Then rinse with water, and clean again with alcohol. 7. Preheat an iron to linen temperature - this is most of the way up on the dial on most irons. It would be better to use an iron with no steam holes in the sole plate, but in fact mine has them. It would be even better to devise something that would provide uniform, controllable pressure and uniform heat, maybe made from something like an electric pressure grill, but I haven't gone that far yet. 8. Cut out the artwork and place it face down and centered on the board. Pressing the iron briefly on the paper will adhere it to the board. Then use a uniform back-and-forth motion with the iron, with moderate pressure, to iron the paper onto the board. Keep this up for 90 seconds, rotating the board regularly to get even coverage. 9. Now put something cylindrical under the board, a rolling pin or a wine bottle, for instance, and continue ironing for 60 seconds, putting the iron on the board and rolling both of them on the cylinder. This encourages uniform pressure over all parts of the board. 10. Drop the board into a bowl of soapy water. I've experimented with fabric softener, which is supposed to be good for removing wallpaper, but it doesn't seem to work better than soap for this. Wait at least an hour so that the paper softens. Now you can start scrubbing (with moderate pressure) with an abrasive sponge like a Scotchbrite sponge. You may also want to rub bits of paper off with your thumbs. At this point, a toothbrush might be useful, but I've never tried one. The toner is surprisingly tenacious, so you can get away with a fair amount of scrubbing. Avoid peeling the paper off, as some toner will come with it. Eventually, all the paper will be gone - check carefully at this point (possibly with a loupe) to make sure that nothing is left clinging between parallel traces. You can now tell if you've ironed too little or too much; in the one case, the toner will have flaked off in spots; in the other, you'll see that it will have melted. 11. Etch the board by dropping it into a pan of ferric chloride solution. It is important to constantly remove the dark layer that builds up on the surface of the board while etching. This can be done with a fancy setup involving an aquarium pump moving etchant around, or by constantly agitating the pan. I get very fast results by just using a small foam paint brush (or a chunk of sponge on a wooden stick) to constantly brush back and forth over the surface of the board. This saves a lot of time and I think produces a cleaner etch. 12. When the board is etched, rinse it carefully and completely in water, and then put a coating of floor wax on it to passivate it. I used to use Tin-It, which is a self-plating tinning product, but it's touchy to use, and the floorwax works very nicely, burning off when you apply a soldering iron. It's not good to put the used etchant down the drain, but you can dump some baking soda in it to precipitate the copper (as copper carbonate), which leaves a salt solution that you can filter through a paper towel, then put down the drain. It's now easier to safely dispose of the solid material trapped by the paper towel. 13. To do a double sided board, first iron the top side artwork onto one side of the board, then drill a couple of holes in the board (either at artwork targets or at artwork through-holes on diagonally opposite sides of the board). You can then turn the board over, and using something like short pieces of wire in the holes, line up the bottom side artwork for ironing. 14. Cut the board to its final size. Drill as needed. I use a Dremel tool mounted on a Dremel drill press stand for this.